Also see: Proven HOSP control methods (active and passive), HOSP Photos, History, Attacks (warning: graphic photos), photos and descriptions of other brown birds that look like HOSP, Biology, Population Proliferation, Video Clip of HOSP Attack, information on euthanizing captured birds, HOSP advisory handout for people with boxes used by HOSP and one for commercial facilities allowing HOSP to breed/roost/feed, trap review, and essay "Are HOSP Evil?" Separate webpages with drawings and photos on sparrow spookers, Magic Halo, and How to Trim Wings and Links for more information and DIY drawings. It's possible neophobia (fear of novel objects) may be a factor with HOSP being deterred by sparrow spookers, monofilament, magic halos, and different box styles. However, a HOSP will readily investigate a new wooden box that is put up. Nestbox Type (Also see Nestbox Styles, Pros and Cons) No nestbox suitable for bluebirds is HOSP-proof. HOSP are smaller than bluebirds, and thus can enter any hole a bluebird can fit through. Type of boxes HOSP MAY avoid or not prefer: Again, despite claims you may read, no one has invented a nestbox yet that HOSP will not use. One of the reasons HOSP are so widespread is that they are very adaptable. HOSP tend to be wary of change, and may initially avoid a new type of box. But over time (or due to nest site competition) they may become accustomed to it, and use these boxes. A square hole 1.25 x 1.25" has been suggested (Terres 1953) to allow the slender bluebird access but prevent the "pudgier" HOSP from entering. A "K" box (designed by Terry Glanzman) was reported by some BRAW monitors to be quite effective in deterring HOSP. It is shallow, but has no side ventilation, and the design looks similar to a Gilwood box. A thicker, slick PVC box is being tested by Keith Radel of MN to see if HOSP have trouble hanging on to the entrance. LIGHT: Some speculate that HOSP prefer a dark, deep cavity. Others believe that light is not a significant factor, as HOSP will nest in the open (e.g., on top of a sign), although these nests tend to have a tunnel-like entrance. Varner (1964) felt that bluebirds also prefer darkness inside the box, so a design that lets light in might also deter bluebirds somewhat. The main concern is designs that let in so much light that the interior can overheat, or let in nasty weather. Playbacks (recordings): Some folks have suggested using a plastic/stuffed decoy + tape recording of a call - I'd be interested in knowing whether this is an effective lure for HOSP. Elizabeth Farley (who has worked on projects where birds were target netted) suggested that songs or calls would work best at the beginning and during the height of the breeding season when testosterone levels are high. Calls, especially alarm calls, will often attract members of both sexes, and sometimes individuals of other species as well. If several songs from several different birds are used, it may take longer to become desensitized, depending on how often you play the recording(s). Try playing the recording for about 30-60 seconds, then stop for several minutes before playing it again. This works especially well if you have detachable speakers with really long cords, so you can hide them near your box, and control the player from a distance. You can also record the tape/CD so there is several minutes of silence between songs and just set it up, push play, and watch from a distance. Birds will tend to "fly-by" back and forth over wherever the speakers are first, and then sometimes go right up to them directly when they fail to see another bird. If the bird is released, it is unlikely that you can recapture it using this method. I'm including this because I've seen it proposed more than once - some homemade method to electrify a feeder or birdhouse to "zap" HOSP. Putting aside the difficulties of targeting HOSP only and the technical challenges of properly designing a circuit, this approach is fraught with dangerous possibilities, including seriously injuring or electrocuting yourself, especially for a person who is not a skilled electrician. Apparently there are commercially available feeders "designed to train squirrels and raccoons to stay away from it by giving them a mild electrical shock" that are supposedly ASPCA approved. But as one bluebird landlord said "A combination of selective feeding (or no feeding), in-box trapping, repeating traps, and spookers have proven themselves to be effective and safe methods for HOSP control. I doubt that any electrocution device would prove the same." Personally, I don't want to see ANYONE get hurt, or to accidentally injure or kill a native bird, which would be illegal under the Migratory Bird Treaty Act. Garlic (in a feeder or nestbox) has not been found to repel House Sparrows. It might work on vampires though. Thick wood block hole guards like the one shown on the box below are not thought to deter House Sparrows, and may even be attractive to them. They MAY (according to Bluebird Love) also deter Tree Swallows, although many trail monitors have not had this experience. Boxes without blocks may be accepted more readily by bluebirds (Musselman 1934). They do not deter raccoons. The only purpose they serve is to make it harder for avian predators (jays, etc.) to reach eggs and nestlings, and for squirrels or woodpeckers to widen the entrance hole. A Carrier (slant) box, which looks like a nestbox turned on its side with the hole facing the ground is not effective in deterring HOSP - it may even be preferred by them. It is almost impossible to trap HOSP in this box, and contents may spill out during monitoring. It is probably best suited for flying squirrels. Hanging/swinging nestboxes do not effectively deter HOSP. However, Linda Violett in CA has had success with large hanging two-holed boxes. See more. Starling Extruder Doors used in Purple Martin gourds do not effectively deter HOSP. HOSP adapt quickly to sound frightening devices (fireworks, shell crackers, acetylene exploders, and cymbals, alarm or distress calls). Nixalite (pointy wire generally used to repel pigeons) will simply be used to hold nests in place. Fake plastic snakes inside a box. Some HOSP have incorporated them into their nest. Putting a baseball in the nest cup. Kenneth Y of NY reported that the House Sparrows proceeded to construct a new nest directly on top of the baseball. 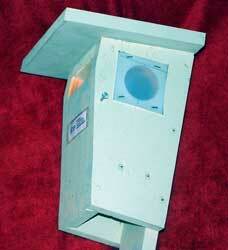 Nestbox Color: It has been suggested that painting a nestbox a sky blue color might deter HOSP. Several folks who had tried it did NOT find that it helped. There is also a concern that boxes painted any color but white will get too hot inside. Frightening Noises: (fireworks, shell crackers, acetylene exploders, cymbals): They move HOSP from an area short term, but the birds become accustomed to them over time unless the sounds are diversified and locations are shifted periodically. All solutions to HOSP control have drawbacks, but not controlling them at all has the greatest drawback.